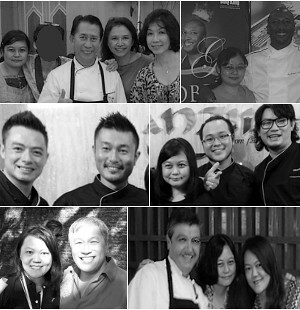 Bloom wherever you are planted, and right now my feet is firmly rooted to the kitchen. 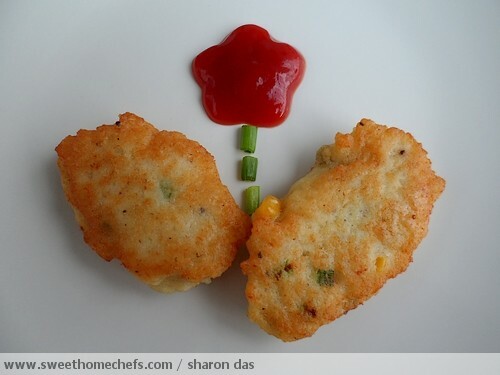 Hence, the inspiration for this little floral design using shrimp cakes, spring onion and tomato ketchup. I have been diligent in ensuring that my fridge does not get loaded with leftover cooking ingredients. A spotcheck revealed that it was time to clear off the spring onions which was starting to lose it's shade and some leftover corn kernels which had been sitting there for a week. 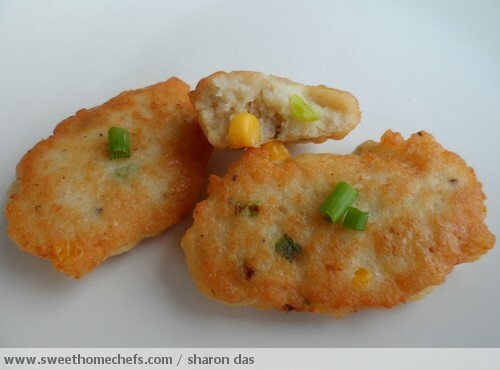 With it, I made shrimp corn cakes - a very doable and versatile recipe. It makes for a nice tea treat. And how did I come about this recipe? I went by blind intuition that surely egg and some flour could stick all the ingredients together! 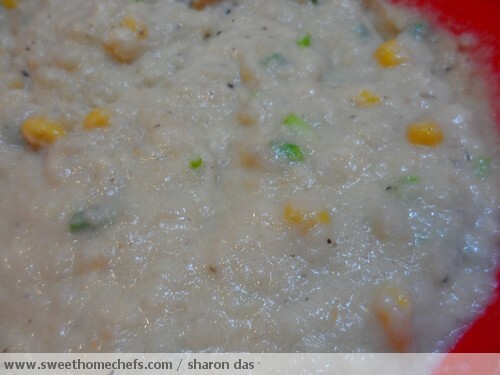 1) Blend shrimp, onion and garlic into thick paste. 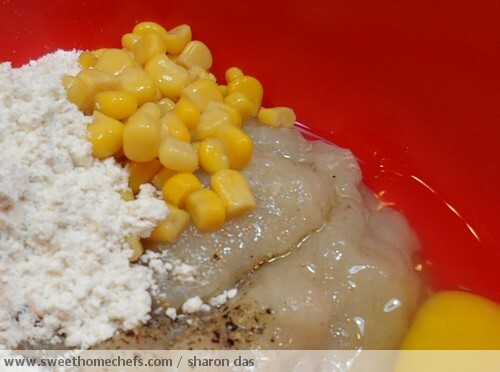 2) Add corn kernels, spring onions, rice flour and egg into the blended shrimp paste mixture. 3) Season with salt and pepper. Stir well. 4) Heat oil in cooking pan. Spoon tablespoon-sized paste onto pan. 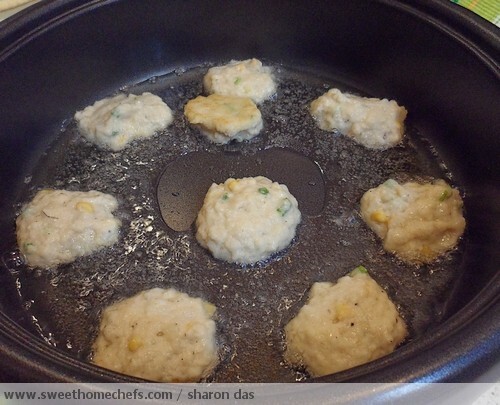 Fry until cooked and browned - takes just a few minutes. I got 16 pieces out of this portion. Best eaten with tomato ketchup. 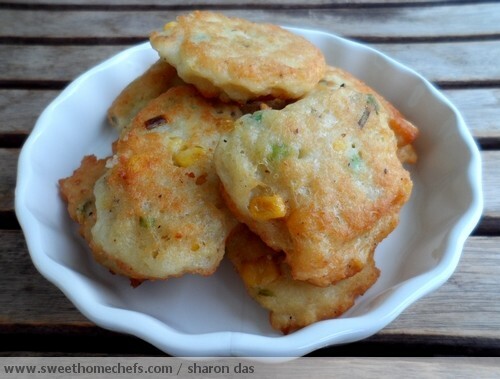 Note: You can double the quantity of corn and spring onions if you prefer or replace it with other ingredients, like chopped boiled carrots or coriander.